Our gift vouchers are a great option for both family & friends! It allows them to choose anything they like for themselves from all areas of the garden centre. Vouchers can be for any amount from £5 upwards. There is no expiry date on them, so they can be redeemed at any time. 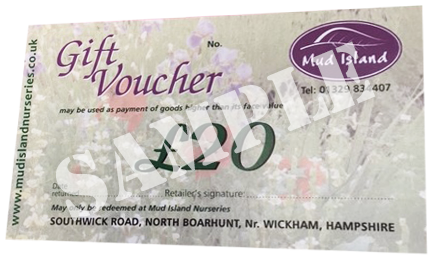 Note: Unfortunately we cannot accept National Garden gift vouchers at Mud Island.